the Big World Blog: does a solar eclipse cause madness? 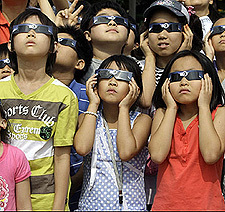 does a solar eclipse cause madness? MUMBAI (AFP) – Indian astrologers are predicting violence and turmoil across the world as a result of this week's total solar eclipse 22 july 2009, which the superstitious and religious view as a sign of potential doom. In Hindu mythology, the two demons Rahu and Ketu are said to "swallow" the sun during eclipses, snuffing out its life-giving light and causing food to become inedible and water undrinkable. Shivani Sachdev Gour, a gynaecologist at the Fortis Hospital in New Delhi, said a number of expectant mothers scheduled for caesarian deliveries on July 22 had asked to change the date. "This is a belief deeply rooted in Indian society. Couples are willing to do anything to ensure that the baby is not born on that day," Gour said. Astrologers have predicted a rise in communal and regional violence in the days following the eclipse, particularly in India, China and other Southeast Asian nations where it can be seen on Wednesday morning. Mumbai astrologer Raj Kumar Sharma predicted "some sort of attack by (Kashmiri separatists) Jaish-e-Mohammad or Al-Qaeda on Indian soil" and a devastating natural disaster in Southeast Asia. An Indian political leader could be killed, he said, and tension between the West and Iran is likely to increase, escalating into possible US military action after September 9, when fiery Saturn moves from Leo into Virgo. "The last 200 years, whenever Saturn has gone into Virgo there has been either a world war or a mini world war," he told AFP. It is not just in India that some are uneasy about what will transpire because of the eclipse. In ancient China they were often associated with disasters, the death of an emperor or other dark events, and similar superstitions persist. "The probability for unrest or war to take place in years when a solar eclipse happens is 95 percent," announced an article that attracted a lot of hits on the popular Chinese web portal Baidu.com. Well of course the soothsayers and astrologers see what they are looking for which is opportunities to enhance their business with predictions of danger and calamity. But the eclipse does have a unique powerful effect for it's viewers. When you first see a total eclipse it looks like nightfall is heading towards you very, very fast. As soon as it reaches you the day completely winks out. It is only at this point that you really even notice the sun. If I explained that right then you will see that it's quite a scary or (awesome) effect that leaves you feeling pretty small and helpless in the scale of world events. It is easy to understand the feelings of apocolypse that often surrounds these events so when the day winks on again and everything returns to normal there is a great feeling of joy and relief. Siva Prasad Tata, who runs the astrology Astro Jyoti site and uses astrology and astronomy software explains "There's no need to get too alarmed about the eclipse, they are a natural phenomenon," the astrologer told AFP. But he added: "During the period of the eclipse, the opposite attracting forces are very, very powerful. From a spiritual point of view, this is a wonderful time to do any type of worship. "It will bring about good results, much more than on an ordinary day."